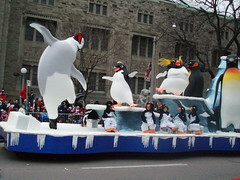 For the third year in a row, I attended the Toronto Santa Claus Parade. This time I took both kids and parked our butts across the street from the Royal Ontario Museum. It was indeed chilly, but the kids had a blast. James even got some great face time to open the Global television coverage of the festivities. He was the kid in the Maple Leafs toque chowing down on clown candy. 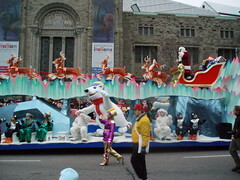 I snapped 74 photos of every float and more for this year's photoset. If you want to go back in time, here's the 2005 photoset and the 2004 photoset.